Distribution centers have a tendency to grow and with Panel Built you can grow up instead of out. The best and most efficient way to add space above your warehouse floor is one of our structural steel mezzanines. They provide an intermediate floor as storage space that can practically double the storage space of your facility. And don’t worry about the pounds per square foot. We’ve constructed mezzanines to house giant, industrial machinery and built others to rigorous military standards. 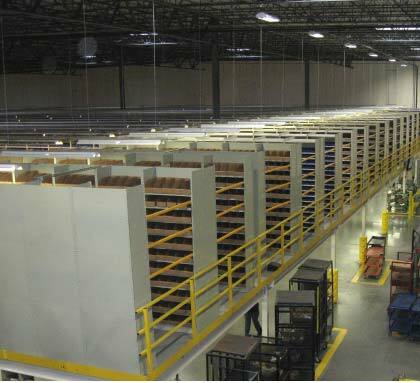 One main advantage a mezzanine would provide a distribution center is Convenience. If you’re running into storage or space issues in your distribution center, then you really only have a few options to solve your mess. You can add on to the outside, build a new facility, or install one of our mezzanines. The first option will probably be much more expensive, and will have a longer lead time than our modular mezzanine. The second option would obviously be more expensive, and would require you to completely uproot your center and change locations. Our mezzanine option is quicker; the lead time on our mezzanines are only 4-6 weeks. And they will be more convenient; all of your storage will be up one short flight of stairs.